The Office of Admissions is here to help you navigate the college search and selection process. Our website will give you the tools to learn more about Cincinnati. 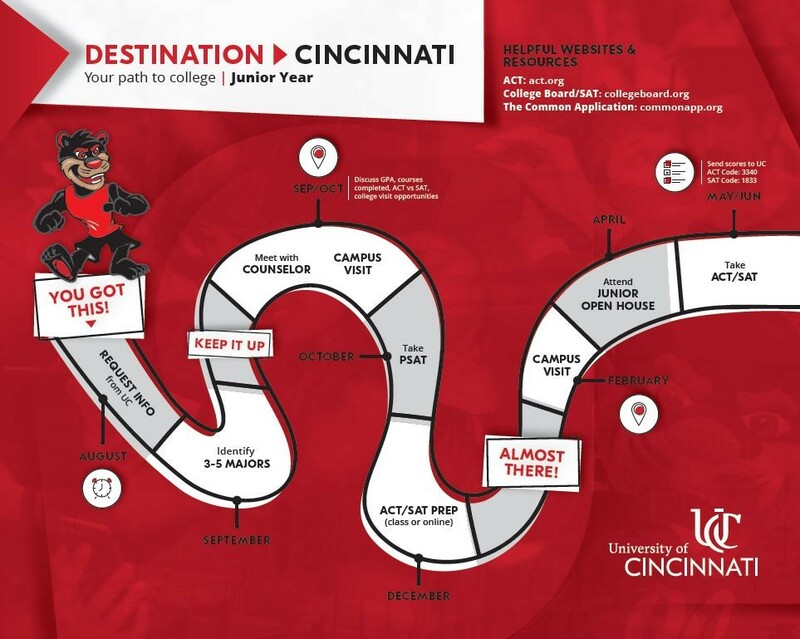 When you are ready to experience Cincinnati for yourself, schedule a campus visit! We encourage you to take charge of your own application process but to help you out, we've created the timelines below. Use these as guides while you complete your application and make your college decision. Keep in mind our early action deadline of December 1 and be sure to review the information we share about what goes into a complete application file. Understanding your finances, and how to plan and manage money for and during college can be intimidating! We encourage you to start your planning process as early as possible. Financial Aid is an umbrella term for merit and need-based aid. This includes loans, grants, and scholarships. The Student Financial Aid Office assists new students as they seek financial assistance and learn to navigate the financial aid process. Although we have the resources to help students apply for financial aid and understand their financial aid package, students and families should not plan to rely solely on a college or university to provide funding in order for them to attend that school. Students should search and apply for a variety of scholarships and the financial aid scholarship search tool is a great place to start. The Student Financial Aid Office also offers a financial aid timeline to assist students as they prepare for their first year on campus. Once you are a student at the University of Cincinnati, OneStop will be your source for information regarding tuition, financial aid, your academic program, and your degree path. 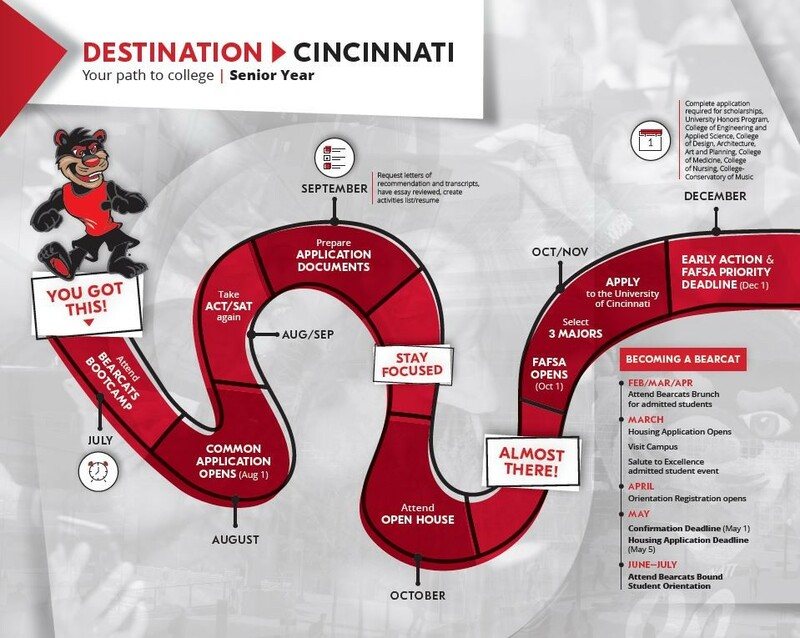 In the meantime, this is where you can find current tuition and fee rates, payment plan information, and much more to help you plan for the costs associated with attending the University of Cincinnati. The Financial Literacy section will help you connect with resources on campus so you can make sound financial decisions. Among Cincinnat's various scholarship opportunities, The Darwin T. Turner Scholars program was established with a mission to enrich the educational environment for undergraduate students by supporting the recruitment and retention of underrepresented students with high potential for academic success. The program was established in 1976 and created to honor an African American student who, at the age of 16 was, and still is, the youngest person to graduate from the University of Cincinnati. We encourage you to review the scholarship information, learn about the unique opportunities available to Turner Scholars, and meet the early action deadline of December 1 in order to be considered.